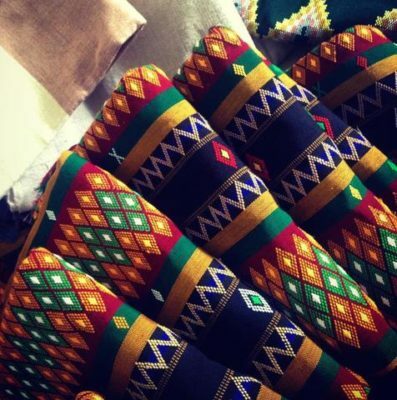 Puans are the traditional clothing of the native people of Mizoram. There are many kinds of Puans, and each colour, motif and design has a traditional and cultural significance to the Mizos. The weaving is done by women on the loin loom and the earnings empower them financially. 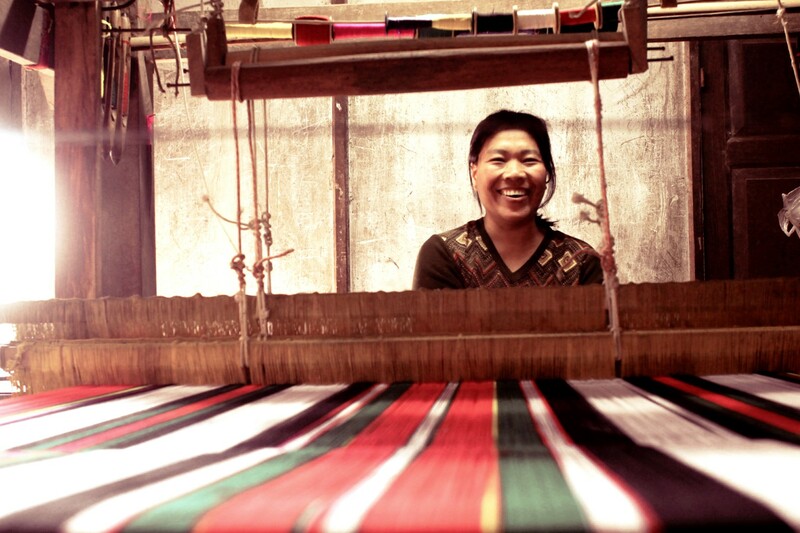 Worn by both men and women, puan means cloth in the native language. Production clusters in Mizoram include Serchhip district (Thenzawl), and Aizawl district(Aizawl). Woven predominantly on a loin loom, the puan is also occasionally woven on a frame loom or a Zo loom. The weaving in the loin loom is done in two parts, and the fabric is later stitched together. Frame handlooms produce single width fabrics. The loin loom is very versatile in the sense that it supports a range of possibilities that can be woven. The weaver sits in front of the loom, fixes the back strap and rests her leg on the footrest. The footrest can be adjusted to keep the loom in tension. The weaving is done on the loom by a shedding motion, a picking motion, and a beating motion. The heald bar is lifted up with the left hand and the circular bamboo bar is pressed down with the right hand. The weft is then passed through from the right to the left by means of the shuttle, and is beaten by the sword. The shuttle is then passed from right to left, and the weft is again beaten. The one-up-one-down process of plain weave is repeated until weaving is complete. The traditional way of wearing a puan is to wrap it around oneself from the waist to the ankle. The length of the puan is normally sixty to sixty-five inches. It takes a week or more to finish a plain puan, and a month or more for one with patterns, on a loin loom. Puan Laisen is a traditional wedding, festival and dance costume, with a red horizontal section in the middle. The Puan Hruih has a white background with black stripes and is worn by both men and women. The Puandum is balck, while its edges are red. The Tawlhlopuan is black, with red, yellow and white strips, denoting bravery. Patterns like ginger flower, stars, roses, tiger’s skin etc are traditional motifs and designs used in the weaving of Mizo puan. These motifs have a traditional and cultural significance to each tribe. The Mizo Puan is considered the traditional clothing of the Mizo people. Now worn mostly by women, the skirts were the common clothing for both men and women. The yarn for weaving was cotton earlier, and has now been slowly replaced by acrylic yarn for its durability and attractive finish. 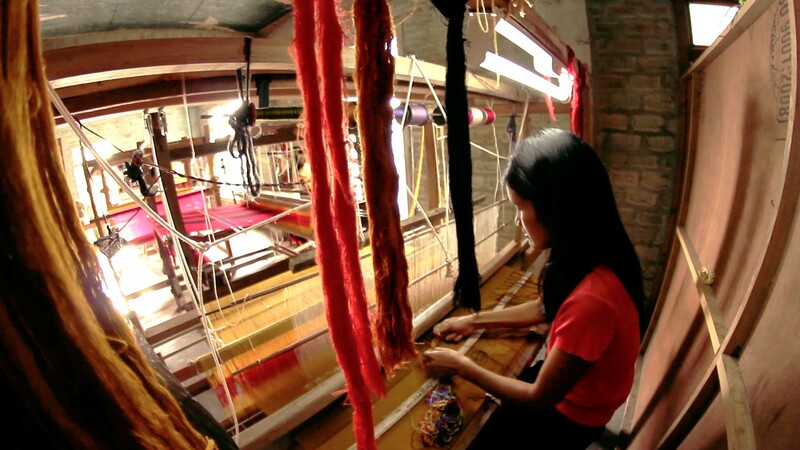 While loin loom was used traditionally, now frame looms, zo looms and fly shuttles are used to weave the puan.